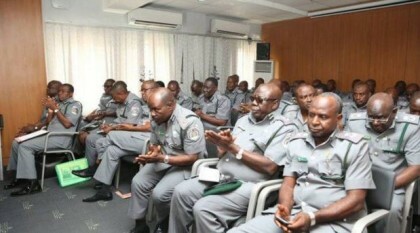 The Apapa Command of the Nigeria Customs Service generated N36.22 billion in November, authorities of the command have said. The command’s spokesperson, Mrs Nkiru Nwalla, told the News Agency of Nigeria (NAN) in Lagos that the collection was an increase of about N6.6 billion from N31.8 billion recorded in the preceding month. Nwalla said that by the collection, the command surpassed its monthly target of N29.5 billion. She attributed the increase in the revenue to the leadership of Comptroller Musa Jibrin, the Area Coomander, who insisted that officers should withdraw from activities that would impede “Ease of Doing Business’’ at the port. Nwalla said that Jibrin had encouraged the implementation of all strategies and blueprints devised to block all revenue leakages while enhancing trade facilitation and security to sustain the pace. “Continuous stakeholder engagement and enlightenment have paved way for wilful compliance seen in improved honest declaration and transparency in the 24-hour cargo clearance procedures. “The command is delighted to re-inform the public that officers are scheduled on 24/7 bases and are ready for all importers and exporters who desire to have their consignments cleared,” she said. Nwalla said that the command had intercepted 24 containers of various consignments due to false declaration, adding that the goods intercepted included pharmaceutical products, frozen fish, medicaments. She said that seven containers of pharmaceutical products had been handed over to the National Agency for Food and Drug Administration and Control (NAFDAC).